Having much difficulty wrapping my head around backup and Dropbox sync in standalone 1Password 7 for Windows. For what it's worth, I have no problem doing this on Macintosh. But it seems more complicated under Windows. I checked convert to OPvault, and 1Password performed the conversion. I saw the converted file in Dropbox, along with the old version. So far, so good. But then--as I'm used to doing on the Mac--I looked for a way to manually create a backup file. And did not find it. So I searched the web, and found numerous how-to articles from Agile Bits. But ultimately, they confused me. I did go to the vault in 1Password sidebar, turn off syncing, and then turn it on again, pointing to Dropbox as the sync destination. So I think that's working correctly. But backing up is another matter. At one point, drilling down into 1Password settings, I was told I need to set up "backup sync." I have no idea what that is and, even though I tried finding support articles, how to set it up. I did see something that said 1Password automatically backs itself up every 24 hours if there have been any changes. But when I sped a lot of time working in 1Password (on my Mac), I feel better if I create a backup and then save that to disk. Can I accomplish something similar in Windows by copying the 1Password_WIN.opvault file in Dropbox to disk? In any case, would you please give step by step instructions for enabling backup in 1Password 7 standalone for Windows, and where to find those backups? (On 1Password Mac, there's a "show files" button in the Backup preference pane.) It appears on WIN 10 to be located in users > AppData > Local > 1Password > backups. And also, would you confirm that I set up Dropbox sync correctly? Hello, @billj! You don't need to do anything to set up automatic backups. As you noted, they're created every 24 hours, if changes are made and sync is enabled. You've enabled sync properly by my read, but I'd double-check the sync location to be sure you know it. Press Ctrl + D, then hover over your vault, click ..., then select "Reveal in Explorer". That will bring up the .opvault folder. 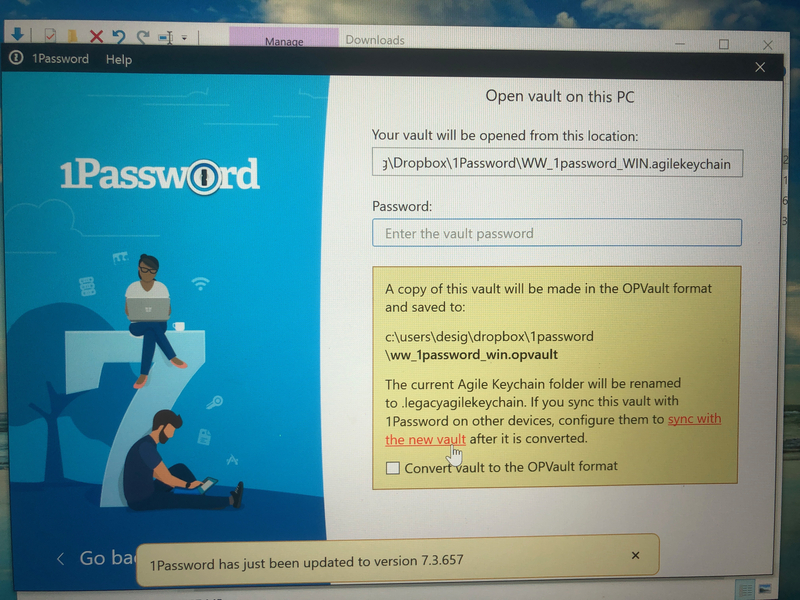 The reason I mention this is that because you had to convert to OPVault, you likely need to point some other devices to the new OPVault as well to ensure they continue syncing with this PC. This will ensure you know where to point them. As for manual backups, you can certainly make a copy of the .opvault folder to disk. Automatic backups are actually zipped OPVaults so it's effectively the same thing. Just make sure to name them in a fashion that lets you know when they were created and keep in mind that if you restore one of these, you'll need to open it up as a separate vault and either reconfigure sync, or move over the items you need to recover to your main vault, as appropriate. We do plan to add an option to create a backup on-demand in a future update.